On Friday, I listed nine ways in which python methodologies could be used with the @ scheduler. How would they work in a real-world musical context? Today, I’m showcasing the List as a super convenient micro-sequencer. That plays hat() eight times, and snare() and kick() twice each. This beats having to type out 12 events. That’s 40 events in two lines of code, with improved legibility. If this was presented as 40 individual events, it would not be obvious that the same hat pattern is repeated four times. A list can be utilized as a bank of patterns, a list of lists. In the following example, an empty bank is created, filled with three patterns, and then used in a four measure sequence. b.append([0, 0.5, 1, 1.5, 2, 2.5, 3, 3.5])               # x.x. x.x. x.x. x.x. Some good, some bad, some ugly. All produce the same result. Examples 2, 6 and 8 are my personal favorites. 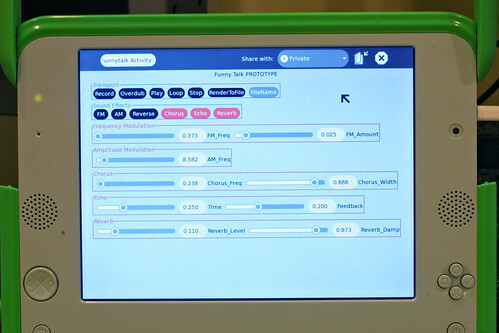 I spent my spare time last week developing two audio-based activity prototypes for the OLPC: Step and Funny Talk. The whole process was surprisingly quick and easy. I attribute this to Victor Lazzarini’s Csound Sugar GUI toolkit. I do a lot of Csound programming, but I’ve never actually done any GUI work for it. Using the toolkit was as simple as defining widgets and mapping them in Csound. Step is the first activitiy I’m developing for the XO. It’s a straight forward eight note step sequencer with synth notes, snare and kick parts. So far, I’ve probably put in about 8 hours on this. Once a user has a pattern they like, they can render the loop to an audio file, which can then be loaded in other activities. It still needs a lot of work, especially the synth engine. Though you can still take a listen if you would like: StepDemo1.mp3. This is my favorite of the two, as my inspiration for this activity comes from my childhood memories of the Yamaha VSS-30 keyboard. My friends and I used to spend hours playing with that keyboard. Often in a very juvenile manner. I figured if we had such a great time playing with our voices, then perhaps the target audience of the OLPC will as well. Here is “the sound of my voice” being processed with Funny Talk: FunnyTalkDemo1.mp3. Here‘s an interesting alternate controller I’ve not yet seen: a step sequencer where one composes a pattern by placing ball bearings onto a grid. Though I don’t exactly have one in front of me, I would imagine the sensation of manipulating the device would be similar to patching a modular synth. There must be something entirely satisfying interfacing with music in this manner, akin to eating with a well-balanced set of weighted flatware. A tangible rhythm sequencer. Ball bearings are used to trigger drum sounds. Visual feedback is displayed from underneath to indicate the current time and the state of each ball bearing. The brainchild behind the Beat-Bearing Sequencer is Peter Bennett. Video posted to YouTube by peterdbennett. Thanks to PAgent of PAgent’s Progress for sending me this link to technabob.com. Getting lost within a list of instrument events is sometimes less desirable than being able to place events on a grid or lattice. This is especially true when working with rhythms. I’m a firm believer that the interface influences the compositional process. This is why I’ve begun development on dseq, an instrument that allows me to input drum patterns in a manner that is much more user-friendly. Last night, I coincidentally stumbled across the development blog for TamTam, “a suite of three applications / activities developed for the $100 laptop.” [source] The program is implemented using Python and PyGTK, and utilizes Csound as its synthesis engine. 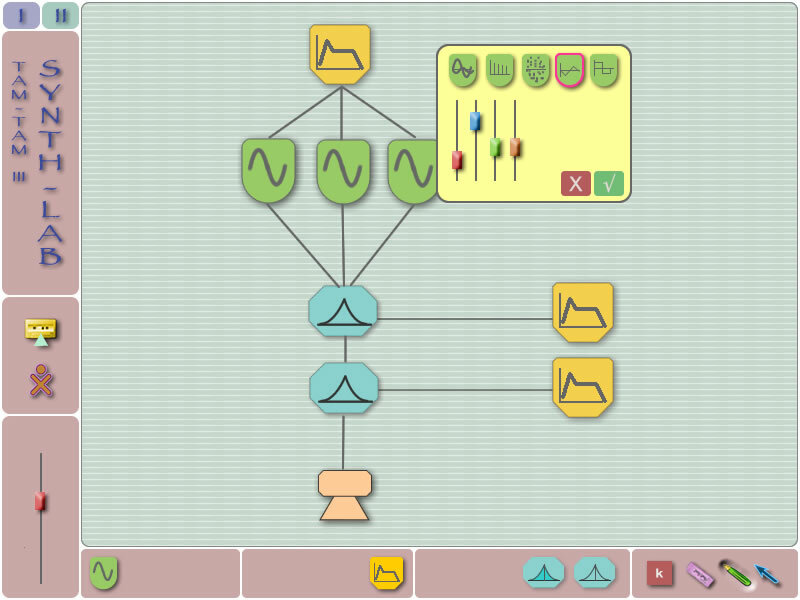 The TamTam GUI appears to be very user-friendly, and reminds me of a simplified version of Max/MSP combined with a midi sequencer. The OLCP is, among other things, a musical instrument. The fact that this musical instrument is going to make its way into the hands of children spanning dozens of cultures fascinates me to no end. As a side note, I can’t help but think of the NAVI computer in Serial Experiments Lain. 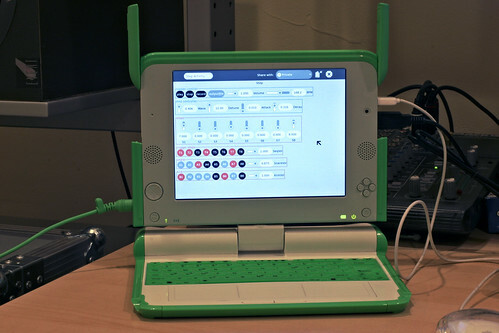 I look forward to the day OLPC laptops become commercially available, so that I may get my hands on one.